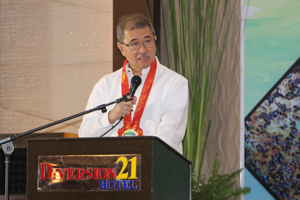 Department of Science and Technology (DOST) Secretary Fortunato T. dela Pena, during his keynote speech in the First Philippine Mussel Congress, underscored the commitment of the department to the development and strengthening of the country's mussel industry. In line with the industry's goal for better quality and safer mussels, the Secretary proudly highlighted the contributions of DOST to the industry, particularly the Mussel Industry Strategic S&T Program (ISP) of the DOST-Philippine Council for Agriculture, Aquatic and Natural Resources Research and Development (DOST-PCAARRD) that started in 2014. The Mussel ISP has already developed key technologies to provide farmers with sustainable and reliable source of quality mussel seeds and enable expansion of mussel production areas. Some of the technologies he mentioned were the Mussel Longline Culture Method; Mussel Hatchery and Nursery Technology; Site Suitability Assessment for Mussels (SSAM); and the Modular Recirculating Depuration Facility Models and Relaying Protocols. Secretary dela Pena lauded the holding of the 1st Philippine Mussel Congress "as a great opportunity to showcase our developed technologies for eventual adoption by mussel farmers leading to "bigger and safer mussels for every Juan." Further, he shared his desire for the R&D community to work relentlessly for the competitiveness, success, and upliftment of the mussel industry through the conduct of the congress as well as its outputs.
" Francisco Quisumbing, a Filipino chemist, invented Quink pen ink which he sold to Parker for international consumption. The ink cleans the pen as it writes, dries quickly on paper, and remains liquid inside the tube. "